This delicious Vegetable Biryani is as tasty as anything you’d find in a restaurant, but it takes less time to make than it would to order takeout. Better, at 194 calories a serving, you can afford to indulge. 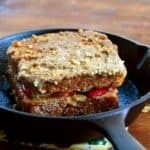 A vegan, gluten-free recipe, can be soy-free and nut-free. 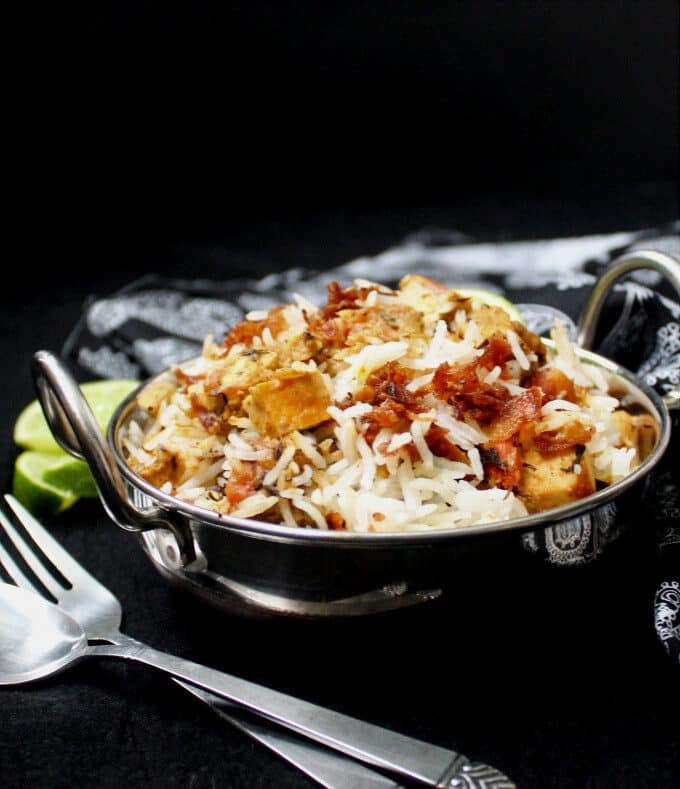 Over the years I’ve shared with you countless recipes for biryani, that delicious rice dish so beloved by Indians and lovers of Indian food. While making one may seem daunting to anyone who hasn’t made a biryani before, I am here today to tell you that it’s really not that hard. In fact, you can make this authentic and delicious one-pot Vegetable Biryani recipe I am about to share with you in just over 30 minutes. And it tastes so good, you will wish you had made more. This is a true and traditional biryani. Just because it doesn’t take half a day to make, or because you get some help from the microwave, does not make it any less authentic. The flavors are exactly the same, you have all the fun, and nobody’s the wiser. Now who’s the smart one? 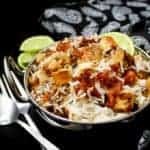 I came up with this easy recipe because at our home biryani’s a favorite with both Jay and Desi. Jay, in fact, can eat it for breakfast, lunch and dinner and in between. So over the years I’ve tweaked this procedure and that to ensure that I can get a delicious vegetable biryani ready for the dinner table or for the lunchbox in no time flat. 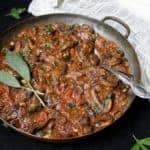 Just because this recipe includes shortened cooking times, it does not mean you can compromise on the ingredients as well. For an amazing tasting biryani, which is what you want, make sure you use the correct ingredients. They are all easily available online or at an Indian grocery store. Use vegetables that cook fast. I used carrots and potatoes. 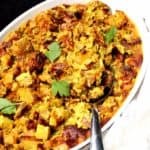 Cauliflower, mushrooms, sweet potatoes, bell peppers, green beans and most kinds of squashes are great and will work just as well. But try to veer away from veggies that would not cook as fast or just be weird in here, like broccoli or Brussels sprouts or cabbage or eggplant. I love them just as much as you do, but they won’t work as well here. 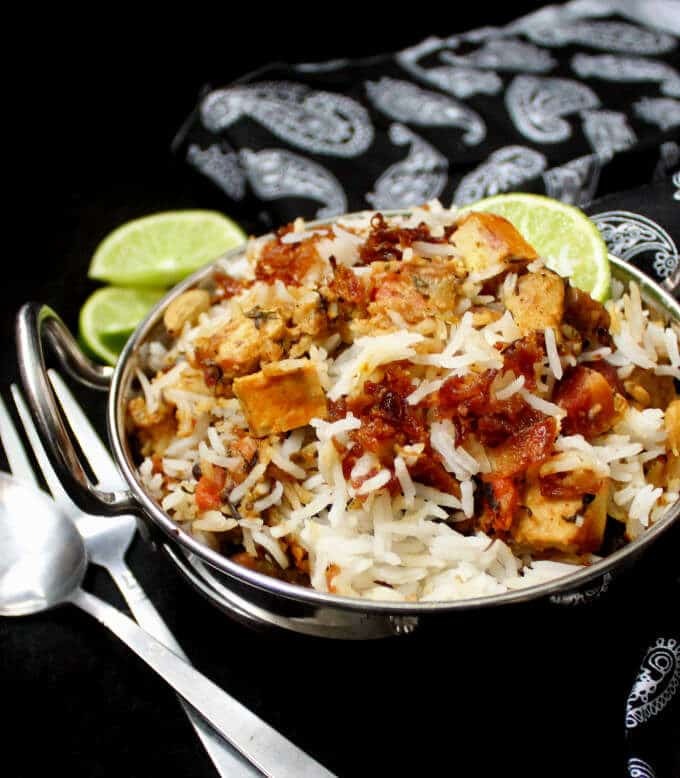 I use baked tofu or super firm tofu in my biryani for more protein. I want to say you can use chickpeas, if you’d prefer a bean instead, but honestly, I’d rather not. Beans in a biryani are just…strange. 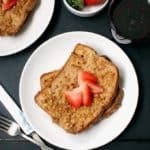 The vegan yogurt is really important for the moisture and flavor in this recipe, so don’t substitute it. 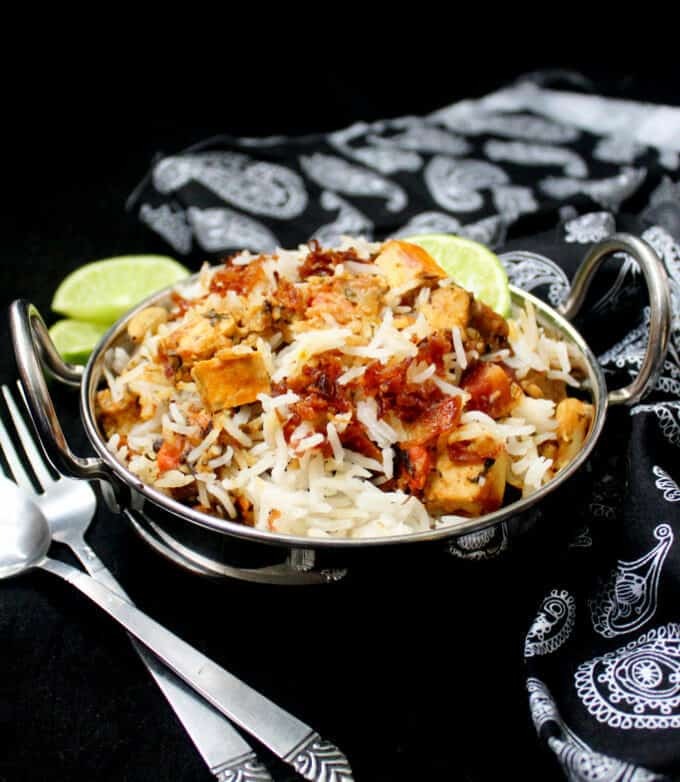 I use my own homemade vegan cultured cashew yogurt, and I can guarantee that it makes a fabulous biryani, but a storebought one would work as well. 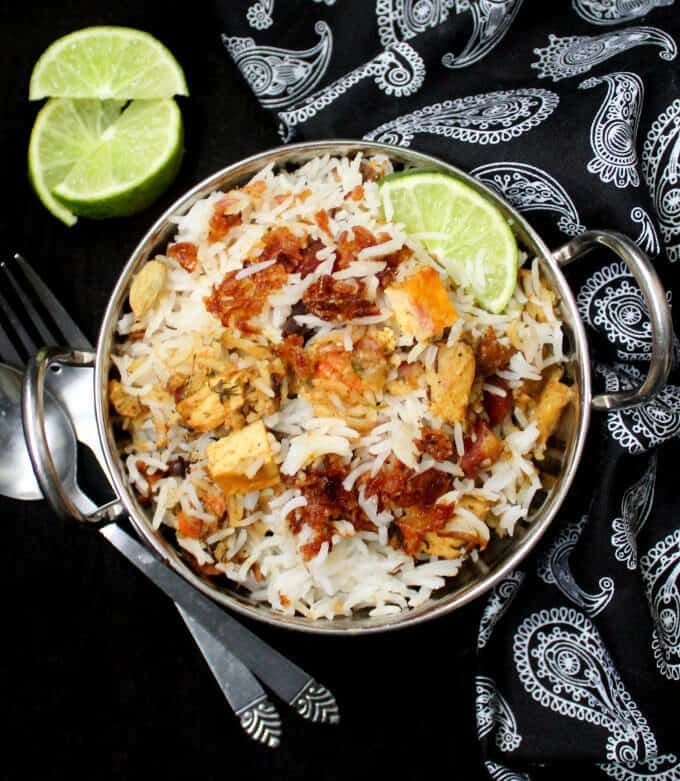 You can take an hour to make this biryani, but if you want to make it in 30 minutes, you will have to follow my exact directions. If you’re a novice cook, you probably will need more time, unless you can chop and prep real fast. If you want to make this recipe nut-free, use another yogurt, not cashew. If you want to make it soy-free, leave out the tofu — you can double up on the nuts instead. This biryani can be eaten by itself, but serve it with some cucumber raita for one of the best meals you ever ate. So let’s get started on that amazing veg biryani. Is your mouth watering already? I know mine is, and I just ate some! This delicious Vegetable Biryani is as tasty as anything you'd find in a restaurant, but it takes less time to make than it would to order takeout. 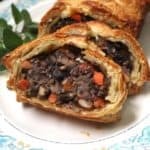 A vegan, gluten-free recipe, can be soy-free and nut-free. 2 tsp caraway seeds (shahjeera). You can sub this with cumin seeds but try to use it if possible. It adds great flavor to biryanis. Place 2 cups of water in a microwave safe bowl along with three green cardamom pods, three cloves, cinnamon, bay leaves and half the caraway seeds. Add salt to your taste. Add the rice to the bowl and microwave for eight minutes. Let the rice stand in the microwave until ready to use. After putting the rice in the microwave, chop your veggies, and simultaneously heat the oil in a large saucepan with an airtight lid. When the oil is hot, add the remaining green cardamom pods and cloves, brown cardamom pods and the remaining caraway seeds. Let the spices cook in the oil for a minute, then add the chopped carrots and potatoes. Season with salt and pepper and then cover and cook over medium-low heat for 5 minutes or until the veggies are almost tender. If the veggies are sticking to the pan at this time, add 1/4 cup of water or vegetable stock and scrape up any bits. Add the cilantro, mint and dill and stir to mix. Add the biryani masala, cashews if using, half the fried onions, tofu cubes and yogurt and stir well. Check if there's enough salt and add more if needed. Bring the masala to a boil. Lower the heat and bring the rice out of the microwave. Run a fork through it to loosen the grains. The rice should be almost done when you take it out, but not quite. Spread it evenly on top of the veggies and masala in the pot. Sprinkle the remaining fried onions on top of the rice. Cover with the airtight lid and let the biryani cook over low heat for 10 minutes, undisturbed. Let the biryani stand 10 minutes after cooking is done before opening to serve. If you don't have a microwave, or would rather not use it, you can make the rice on the stove top. Bring the water to a boil with the spices and salt, add the washed rice, cover and cook for eight minutes or until about 80 percent done. Well this looks great! And that rice is done to perfection! The 30 minute mark sure catches my eye, too! You are a life saver!!! Just signed up for making 2 big trays of veg biryani for a homeless shelter dinner for this weekend and was going to look for a quick recipe . Now I have it and just in time!! Hemi, how lovely of you to volunteer your time to such a good cause. Hope you try — and like — the biryani! I made the 2 full trays using your recipe and it was delicious!!!! In fact, it got over sooner than the chicken biryani at the shelter. Thank you sooo much!!! So happy you liked it, Hemi! Thanks for the feedback. This looks delicious, but how much water is “two bowls of water,” and would the quantity of water be the same on the stove top? Thanks. Hi Camille, it’s two cups! Corrected now, and yes, same for stovetop. Im an avid follower of your blog, I must say all the ones that ive tried turn out perfectly. Thank you so much! 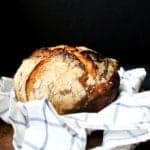 This recipe certainly looks simple and easy to follow. The recipe says “Place 2 bowls of water in a microwave safe bowl” whats the amount of water? Is that 2 cups of water? Hi Shan, sorry about that — it is 2 cups indeed. Corrected! Phenomena (much like any other dish of yours I’ve prepared in the past). Easy to put together and flavors so incredible. I was not familiar with black cardamom pods but after a trip to the local Indian grocery store, I realize that they’re much different than the green. I am blown away with this pot of goodness! Thank you, Vaishali, for creating! Hi Vaishali. Would you mind sharing your recipe for home-made biryani spice mix? Thanks for all the lovely recipes!